Location: Victoria is the capital city of British Columbia, Canada's westernmost province, and the largest city on Vancouver Island. 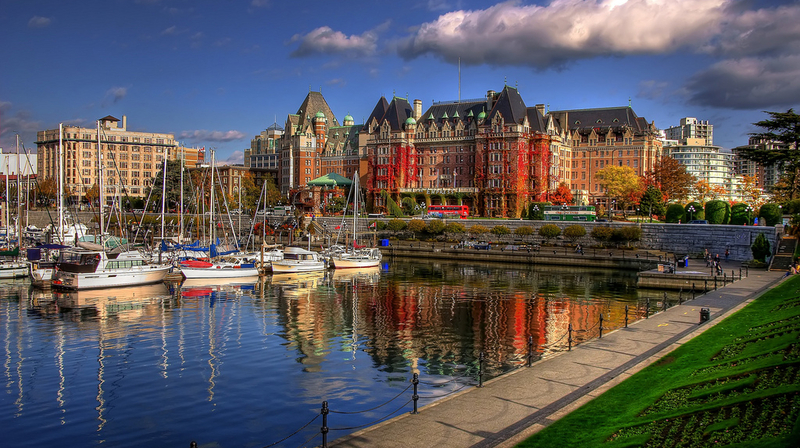 The tournament site is the Victoria Conference Centre in downtown Victoria, near the Empress Hotel and a short distance from the Parliament Buildings. Downtown shopping, as well as dozens of hotels, motels and restaurants of all types, are within a few city blocks. Victoria's climate in early April is usually nice, with little rain and cool to warm temperatures. Driving: Victoria's downtown area features two north-south roads about a block or two apart: Douglas St., and Blanshard St. If you arrive from the BC Ferries terminal at Swartz Bay, from Victoria Airport, or from the Anacortes Ferry in Sidney, all about a 40 minute drive north of Victoria, the highway will put you onto Blanshard St., and you'll need to make a right turn somewhere to get onto Douglas St. Arriving from other Vancouver Island cities will take you through Langford and View Royal, west of Victoria, before putting you onto Douglas St. The Port Angeles - Victoria ferry docks just a few blocks from the site. Transit: Victoria Transit has many routes that go through the downtown area, connecting places as far as the ferry terminal, airport, and communities to the north and west of the city. Bus: BC Ferries Connector connects Vancouver's Pacific Station and Vancouver Airport with downtown Victoria, leaving Vancouver four times daily. Restaurants and Shops: The Convention Centre is near many local restaurants and shops of all types, mostly north of the site. The Bay Centre is a shopping mall built from historic buidings in 1989, about five blocks north of the playing site. The downtown area has a few small grocery stores but for a large grocery store you will need to travel a fair distance. Tournament Site: Parking wherever you see an open spot in the downtown area is not recommended, and has led to difficulties for players in the past. Parking in the Convention Centre lot has a special bridge rate, which you must specifically mention when you leave, of $10/day, with in/out privileges. The parking entrance is off Douglas road on the south end of the site. A week-long parking pass is available for $70. Tuesday Debbie Wastle "Who are You Calling a Dummy?" Wednesday Ewa Zwicky "Play With Finesse"
Friday Rhonda Foster What's Forcing? Dates, Times, Events, Fees: 8:45 am, 1:00 pm, and 7:00 pm are the start times from Tuesday thru Saturday. The tournament begins on Monday April 8 at 7pm, with a Monday-Tuesday Knockout Teams, an Open Pairs which is the first Evening Side Game, and a 199er Charity Pairs. On Sunday April 14, play begins at 10:00 am with stratiflighted two-session Swiss Teams and a Fast Open Pairs, as well as a pair of single session 199er Swiss Team events. Sessions should end 3¼ - 3½ hours after they begin, on Sunday things should end by about 6pm, and possibly earlier. Morning Sessions from Tuesday to Saturday have two pair events: the Morning Side Game Series (open pairs), and a 199er Pairs game, but there are two-day Morning Swiss Teams on Wednesday-Thursday and Friday-Saturday. The main sessions are afternoon and evening, with new afternoon-evening knockout teams starting on Tuesday, Wednesday, Thursday, and Friday, with a Compact Knockout on Saturday and the familiar single session Swiss Teams in the evening for teams that are unlucky in the main knockouts. Each day from Tuesday thru Saturday has a two-session Open and Gold Rush Pairs, and Side Game Series for Morning, Afternoon and Evening Games. There are three single session 199er games every day from Tuesday thru Saturday, as well as the Monday night opener, and the two single-session 199er Swiss Teams on Sunday. There are two free games for players with less than 20 masterpoints, on Tuesday and Thursday afternoon. Players in all games will need to have an ACBL number (even from a membership that has lapsed); those without an ACBL number will need to purchase a temporary membership for $9.95. The per-session entry fee of $15 will have a $4 surcharge per session for players whose memberships have lapsed. New this time: Gold Rush two-session 0-750 Pairs Tuesday thru Saturday; new 199er games every day at 8:45am Tuesday thru Saturday. Two double session Morning Swiss Teams on Wednesday-Thursday and Friday-Saturday. Flight A winners: Alex Hong, West Vancouver BC; Sidney Yang, Richmond BC; Lu Gan - Kai Zhou, Burnaby BC. Flight C winners: Jennifer Hong, Burnaby BC; Henry Yao, Vancouver BC; Lisa Li, Surrey BC; Flora Yan, Langley BC. The other two flights, the B Flight (0-2500) and the unlimited Championship Flight, will be contested this weekend as part of the Regional. To play your team must have earned a club qualification at club games held during the qualifying period from September thru February (and in some cases into March), or pay a fee for all unqualified players. Both events will be full two-day events with the actual format depending on the turnout. In the championship flight especially, there are regulations about pre-disclosure of unusual methods and it is recommended that you sign up early (by 12:30) so that everything required can be taken care of before the game. More detailed information is here and on the GNT flyer (pdf) here. There will be details on each event, what type of game it is, what the strat limits are, the winners at the previous Victoria Regional in 2017, and a direct link to the ACBL Live results, which will be active following each session. Once a day is complete, no changes will be made unless there are late scoring corrections. Some browsers save a copy of a page and do not check to see if the content has changed; in most browsers you should be able to hit F5 to reload the page and stop using the one your computer has saved. Above the Strike Zone: Try not to include in the frame any part of the body below where the letters would be on a baseball uniform. People want to see faces, not waistlines. If you have people of different heights, you might have to include the tall one's strike zone(s), but make faces your focus. Fill the Frame: Don't stand so far back that only 10%-20% of the frame is faces. Move up close and look at your screen as a guide. I will always crop out legs and shoes, and if this leaves an image that is small, the quality will suffer. Send the biggest version you can: It's important. ooga@shaw.ca is the address to send photo files to. Don't send the one that takes up the least bandwidth, it will look blurred on a screen if the resolution is lowered beyond a reasonable level. Identify! : I need to know who the people are and what they did. If they won an event, tell me which one and first names from left to right in the photo will suffice (I can get the rest from the data I am sent). I'd also like to credit the photo taker, so tell me who you are as well. Watch the lighting and background: At night, photos taken in the dark may not look too well and require touchup. The playing area is usually best for light. I have taken a lot of photos that seem to have trees coming out of the tops of people's heads, so avoid that if you can, although now that all photos will appear online in colour (as opposed to monochrome on paper), this is not as big an issue as it used to be. Leavenworth has some great outdoor scenes that would make great photos: if your team goes out for dinner, take a photo of the team somewhere and send it along if you win! Simple is usually best, against a wall inside the playing area, or even in a space in the middle with people milling around a distance away can sometimes work. Patience: There's a lot to do at scary hours during a Daily Bulletin week, and it may take a day or two before I can get around to posting photos. Or responding to those who have sent them. The Table Counts page simply has a spreadsheet with table counts and event types which can be used as a nice visual schedule to the different types of events, as well as to track the attendance of the tournament. This is a pdf of a large spreadsheet and will depend on your pdf displaying software. Finally, the ACBL Live Results link goes to the list of tournament events, from which you will need another click or three to find the specific event you want. Direct links are available from the daily pages and may be faster. Thanks for visiting! This is still a work in progress and the progress in getting it where I want it to be is quite slow, but there's quite a nice new look from what I was producing in Penticton last year (for which I must thank Google Fonts, Python, and several good sources of HTML5 and CSS material). Feel free to contact me (see above) with reports of errors or if something isn't working for you.